A Good deal more. Complex cross-border transactions require a Canadian law firm that not only is expert in Canadian law but also is sensitive to the issues raised by markets and legal and regulatory regimes internationally. 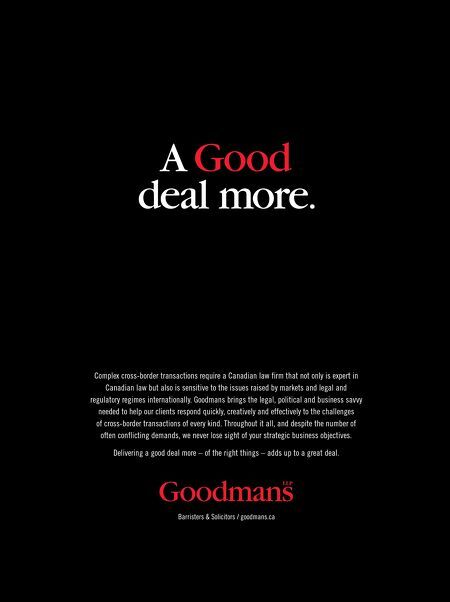 Goodmans brings the legal, political and business savvy needed to help our clients respond quickly, creatively and effectively to the challenges of cross-border transactions of every kind. Throughout it all, and despite the number of often conflicting demands, we never lose sight of your strategic business objectives. Delivering a good deal more – of the right things – adds up to a great deal.